Mashable posted about Lunch.com's new ability to organize and post Twitter lists (http://mashable.com/2009/09/30/lunch-twitter-lists/). In it they mention TweepML.org for a comparison. I checked out both and there's two different purposes. The Lunch.com lists are imported from your followers. You can organize your followers into lists and people can easily follow your "groups". It would be like Tweetdeck allowing you to publish your "groups" as "who to follow" lists. TweepML.org makes it easy to publish groups that may not be in your following. For me, it allowed me to quickly publish the attendees of WBC 09 and the members of OWC – over 1000 wine people in total. Other people have published wineries, etc. Its really jolted the wine community into another gear on Twitter. You can't do the same with Lunch.com. Lunch.com is cool, but not really a tool for stoking a community. Just a way to introduce your friends to other people really. Anyway, just FYI. I poked at it for a little bit today and that's what I found. Embed this on your wine blog! Working on another Twitter contest (I'm going to run a few as we experiment a little). This time we used the Twitter contest to drive traffic (the first was a follower campaign) to a new resource center for wireless networks. I decided to work with Ads to kick off the contest. Last time I used an email list we have internally to let everyone know about the contest. The online ads were on a very prominent trade publication. We had inventory from another ad campaign so I used it to kick off this contest rather than blast an email list and over-fatigue that list. So far (about a half a day into the contest) its pretty clear that email is a better launching point for a viral campaign. It was to be expected, but its dramatically different so far. Its just interesting to see as we go through different "theories" (since all the "experts" that spew advice out there seem to be giving alot of conjecture anyway. Of course, having some Twitter power users helping kick off a campaign also helps…. Follow 1000 Wine Business People (OWC Members) with 1-click! Since I run the OWC and I’m implementing some important community features that will FINALLY make the community closer to what I envisioned, I figured I’d get a jump on this. Each OWC member enters their Twitter ID (if they choose). I am using TweepML to make it “One-Click” to follow 1000 wine people. Click through these links. Each one is about 100 wine people on twitter (OWC Members). This will give you 1000 wine people (in the industry mostly) from all over the world instantly in your Twitter stream. This IS NOT SPAM because they won’t see you unless they follow back. But you’ll be a fly on the wall to the largest online wine business community in the world!!! Join the largest online wine business community on Twitter TODAY!!! UPDATE: Don’t go follow all 11 lists right away. Twitter will halt the process as it looks like someone who is preparing to SPAM (even though you’re just trying to catch up with the community). They can’t tell the difference, its a hard-coded function of their API. If you get a “Suspended” notice for your account, don’t worry, you’re not suspended completely from the service. They’ll halt your following for a little while. Also, there is a limit to the number of people you can follow (2000). If you hit that limit and the ratio of “following” to “follower” is out of wack then you won’t go past 2000. This is another hard-coded limit. Author Joel VincentPosted on September 11, 2009 Categories Uncategorized7 Comments on Follow 1000 Wine Business People (OWC Members) with 1-click! This is pretty amazing and cool. I've created two 100 person lists using TweepML. It only lets me add 100 people at a time (I have a list of hundreds through the OWC network of wine businesses) but this gives you an idea of just how easy this really is. Try it if you want a jump start on wine folks! VERY very cool. 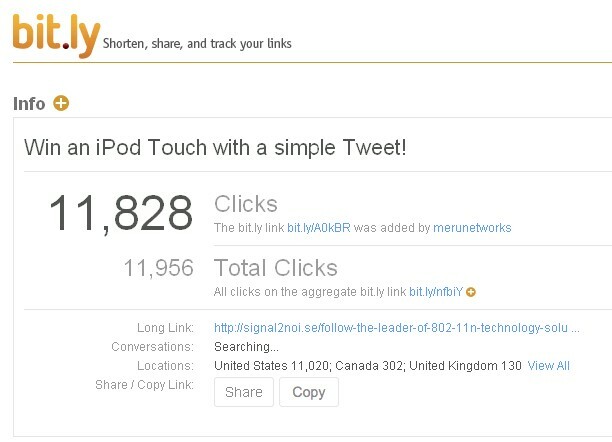 Bit.ly metrics not jiving, any thoughts? Maybe its a Bit.ly snafu but here's what I'm trying to reconcile. Bit.ly generated a report for my Twitter link last week and that image is what the stats look like. Now that would be great except Google Analytics is telling me the campaign landing page got about 500 abs unique visitors the day that this says I got 10K+ clicks. Any thoughts? Are Bit.ly stats unusable? That would be really a shame because these campaigns are all about metrics! Author Joel VincentPosted on September 3, 2009 Categories UncategorizedLeave a comment on Bit.ly metrics not jiving, any thoughts?